KREATOR - EXTREME AGGRESSION VINYL RE-ISSUE (3LP) | Online Shop | Wizard LTD. 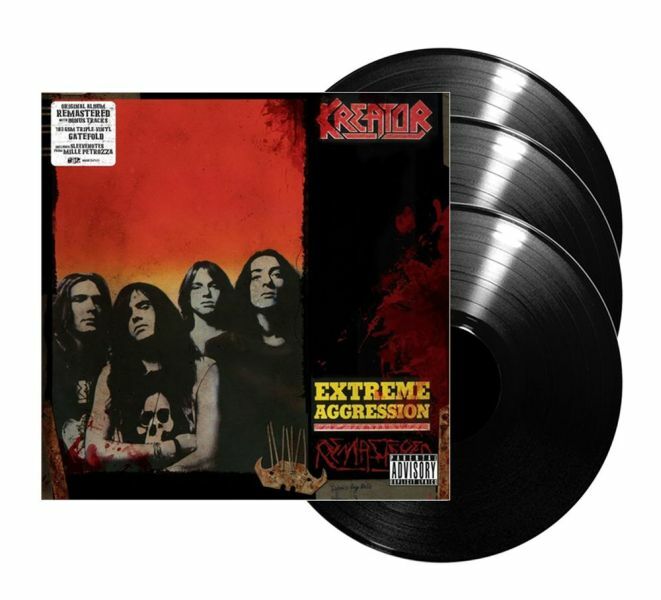 Album: "EXTREME AGGRESSION VINYL RE-ISSUE (3LP)"
The Fourth album by Kreator, Extreme Aggression was released in 1989. This album introduced many American fans to Kreator, primarily through heavy rotation of the “Betrayer” music video on MTV’s Headbangers Ball, which was partly shot at the Acropolis in Athens, Greece. On Extreme Aggression, Kreator closes the ’80s by delivering their final thrash triumph. With the most hallowed Kreator line-up joining forces once again to follow up the spectacular Terrible Certainty. The results are fierce and noisy on this 1989 Epic release. Extreme Aggression quickly became their biggest seller yet, and the subsequent North American tour with Suicidal Tendencies introduced the band to many new friends. This version contains a show recorded in Berlin in 1990 that showcases the band in full flight.